Who would have known that a ‘hashtag’ would be such a phenomenon in 2019? Thanks to Facebook’s adopted sibling – Instagram – it is more than a phenomenon, it is close to being the world’s 8th wonder! Third most popular social media platform has an astonishing 1bn people using Instagram every month (#insane). What’s more, there are over 25M business profiles, and over 200M users are visiting at least one business profile every day. Right, enough with stats. The proxy provider with the #1 success rate for scraping Instagram is Luminati (93.95%), making it the best proxy service by this measure. 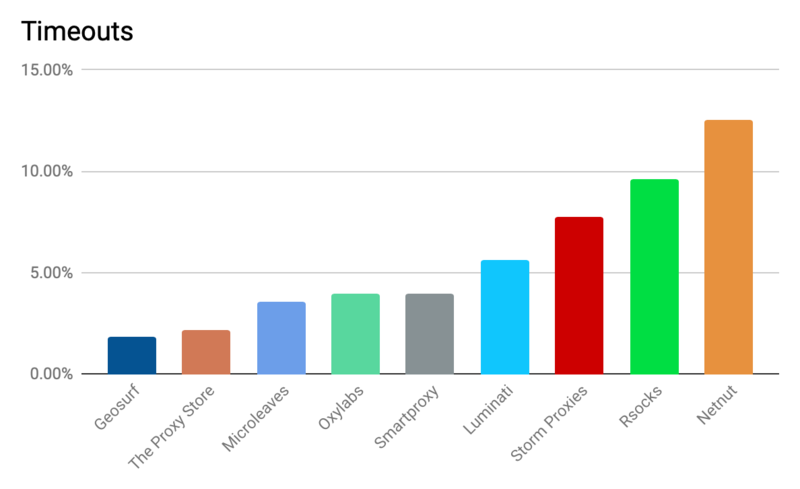 That being said, 7 out of 9 proxy providers are over the respectable 80% success mark, leaving only The Proxy Store (73.72%) and Microleaves (49.17%) hanging around at the bottom of the table. 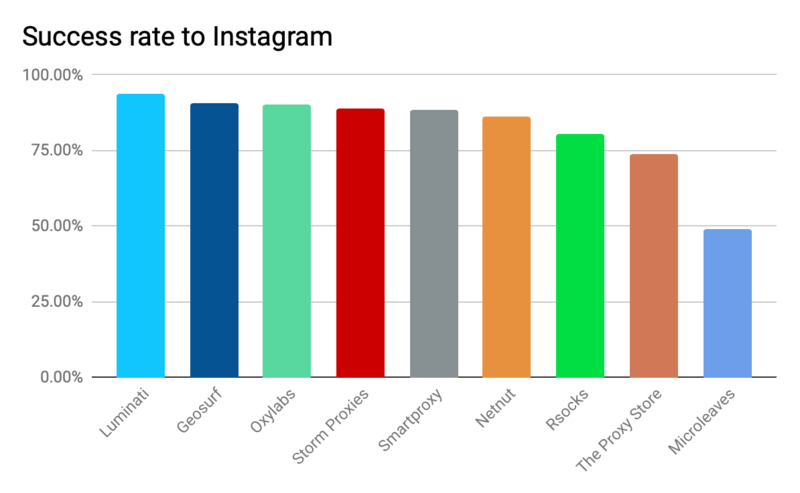 As the margin between the top 7 proxy providers for Instagram success rates is relatively small, let’s dig a little bit deeper and figure out how each proxy provider in question performed on various other important metrics when it comes to scraping Instagram. But before we do, let’s check out the overall success rate to all targets (Aliexpress, Amazon, Booking.com, Facebook, Google, Instagram, Wayfair, and Yandex). Luminati (93.95%) – Known as the world’s largest proxy provider, with more than 39.9 million residential proxies and growing. Geosurf (90.86%) – Big residential IP network consisting of more than 130 proxy server locations worldwide, 2nd most versatile proxy provider by success to all targets. Oxylabs (90.11%) –Residential proxy network with more than 30M residential IPs from all 195 countries around the world, offers the most versatile and stable proxy infrastructure on the market. Storm Proxies (88.76%) – Provides private dedicated proxies and residential backconnect rotating proxies from a network consisting of more than 40,000 rotating residential proxies. Smartproxy (88.54%) – Flexibly priced residential proxy service providing more than 10 million rotating IPs, also immediate and highly-praised customer support infrastructure. Netnut (86.44%) – Speed-optimized residential proxy provider sourced from DiViNetworks, which provides services to more than 100 ISPs. Rsocks (80.30%) – Offers very fast and legit 150K residential proxies and 390K exclusive proxies. 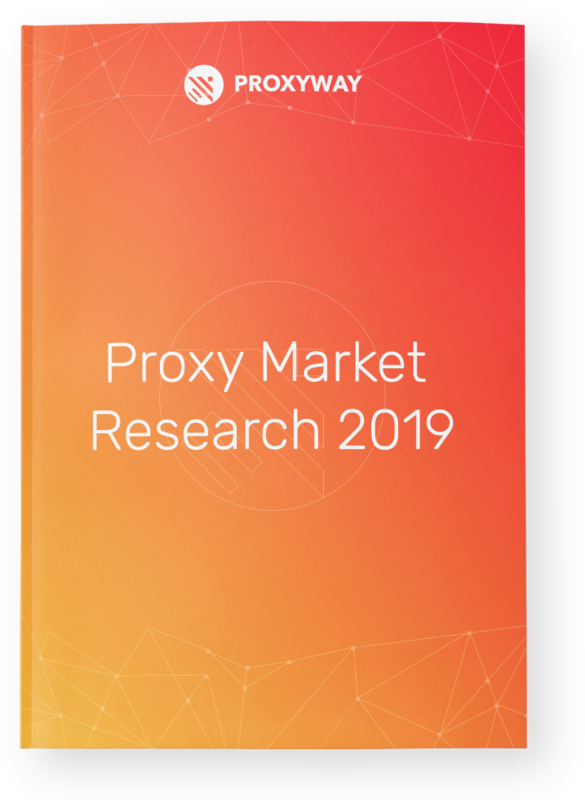 The Proxy Store (73.72%) – Provides access to a network of millions of residential proxies with unlimited bandwidth. Microleaves (49.17%) – Big IP pool consisting of more than 26 million IP addresses. 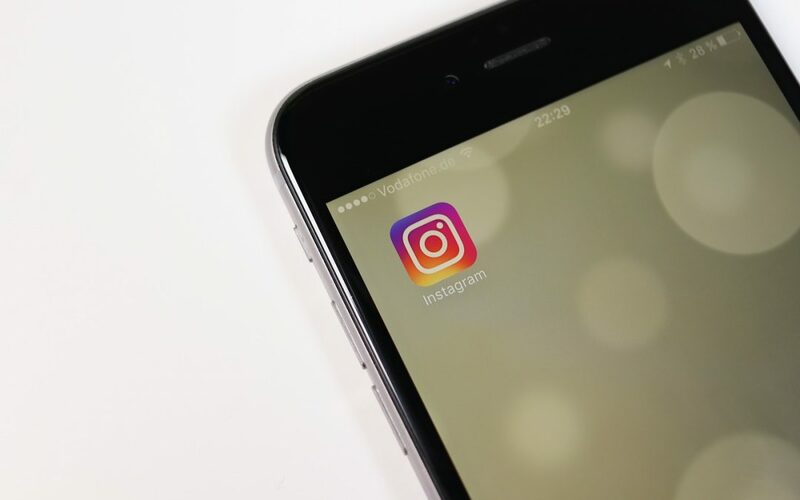 We are aware that there are other suitable proxy providers for Instagram scraping on the market (If you are considering any other brand, and would like for us to test them out, leave a comment below this blog post). 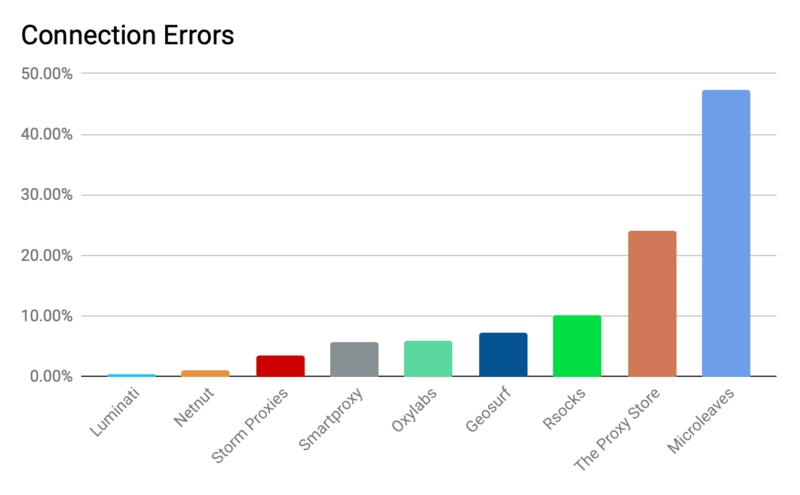 The nine listed above are the most popular and have been tested for Instagram’s success rate, overall success rate, connection errors, timeouts, and blocked requests in a thorough 2019 residential proxy service comparison. 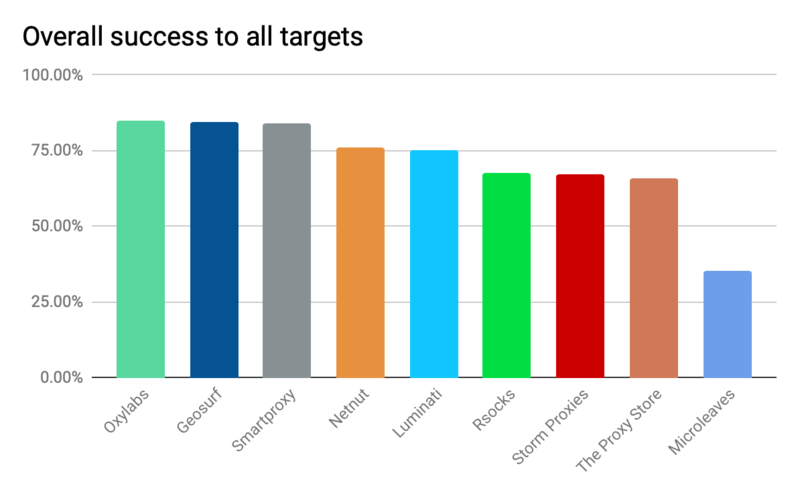 When it comes to dealing with connection errors for Instagram scraping, Luminati (0.42%) is firmly holding on to the first place, followed by Netnut (1.02%), and nearby we have Storm Proxies (3.41%). The bottom three providers by connection error measure are Rsocks (10.08%), The Proxy Store (24.10%), and Microleaves (47.28%). Proxies from Netnut (12.54%) experience the highest percentage of timeouts. Right behind them we have Rsocks (9.62%), and Storm Proxies (7.76%). 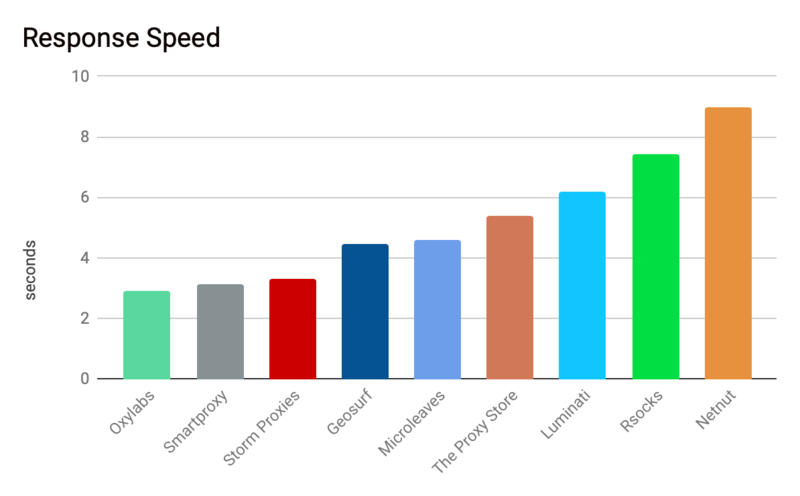 On the contrary, Geosurf (1.87%) has the lowest percentage of timeouts, followed closely by The Proxy Store (2.19%), and the third place goes to, Microleaves (3.54%). 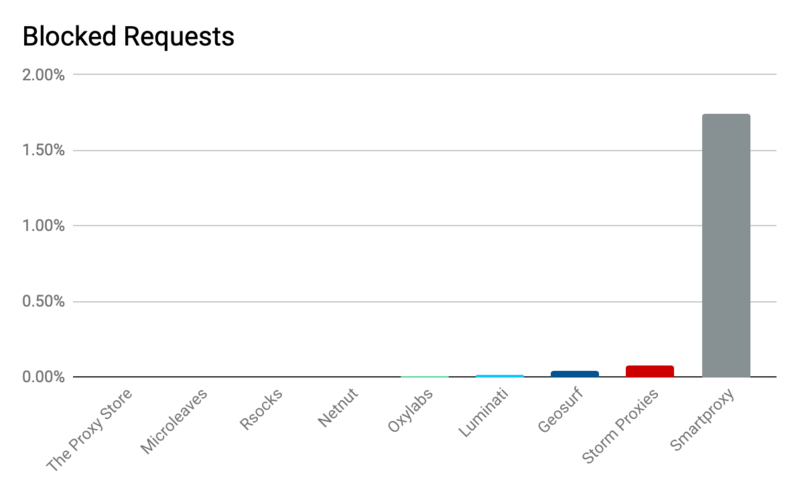 In terms of blocked requests, all the proxy providers performed really well. Netnut, Rsocks, The Proxy Store, and Microleaves performed flawlessly with 0% score. We hardly have any comments for all nine proxy providers that would raise any concerns when it comes blocked requests for scraping Instagram. When it comes to Instagram scraping response speed is essential and should always be taken into account. The winner in this category is Oxylabs (2.96s), breathing them down the neck we have Smartproxy (3.13s), and Storm Proxies (3.3s). The worst performing proxies came from Netnut (8.98s), Rscoks (7.41s), and Luminati (6.19s). It is easy to see that there is more than one factor you should be thinking about when deciding which proxy provider to use for Instagram. Make sure to check out the stats and suggestions one more time if needed, and if you have any questions feel free to comment below and we will be happy to reply. 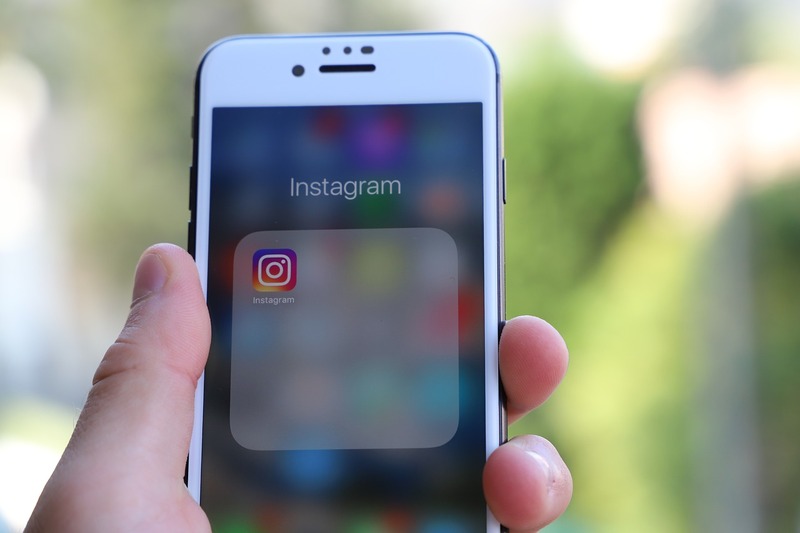 We hope that you will have no problem deciding which residential proxy provider is right for your needs when it comes to utilizing them for Instagram platform.